iPhone 5 Video Introduction is Out & iPhone 5 Lightning Connector Adapters Prices Revealed! Before we start to talk about Lightning connector and its adapters, let’s enjoy the beautiful and elegant video of iPhone 5 introduction. After knowing the price of the iPhone 5 Lightning connector adapters, some fans and those who are considering iPhone 5 might run away lightning fast. No wonder they don’t announce it on the stage because the prices charged are quite on the high end. For those who have invested heavily in the iDevice ecosystem, a change on the basic features will definitely be a big no-no. Apple just did that with the change of the 30-pin connector to 8-pin connector. For those of you that haven’t invested heavily in iDevice ecosystem, you are not very affected by this. Just that maybe you will need to wait for more accessories to come out that are compatible to Apple’s Lightning 8-pin connector. 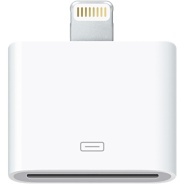 This adapter thing is going to piss a number of people, especially the ones who are considering to switch to iPhone. Why in the world Apple does not want to use the regular micro-USB that is being used by every other smartphone. Just because they ‘Think DIfferent’? 😛 This is also the same issue with Sony using Memory Stick as their storage. I was a user of Sony CyberShot camera. I didn’t feel the problem until when I am using Nikon which uses SD card. It is really troublesome to use an adapter. Finally Sony latest products are now compatible with SD cards. Thank God! Still, I believe many Apple fans will accept it and live with it. Hope that one day either Apple will change its mind and use micro-USB (which is unlikely since the company has invested a lot in their Lightning cable) or the other phone manufacturers see the benefits of Lightning cable and decided to use it. Well, let’s wait. (said with full sarcasm). By the way, the Lightning adapters and cables are compatible with iPhone 5, iPod Touch (5th generation), iPod Nano (7th generation). 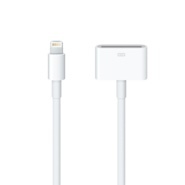 There are some 30-pin accessories or devices that are not compatible to the Lightning as what is written in the Apple Store page for Lightning. Lightning to USB cable can be shipped immediately and within 1-3 business days while the adapters will have to wait until October with no specific dates. What’s your say? Too expensive or acceptable? iPhone 5 Keynote Leaked Out & Summary of iPhone 5 Rumors!!! Here Are the Highlights of Apple iPhone 5 Event!!! Previous story Here Are the Highlights of Apple iPhone 5 Event!! !